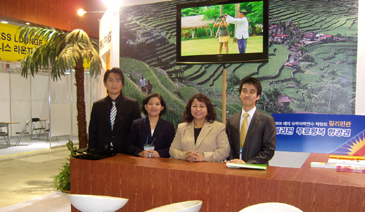 Ms. Maricon Basco-Ebron(far right), tourism director and tourism attaché at the Philippine Embassy in Seoul with her staff members at the Philippine booth. A high-powered Philippine ESL delegation has joined the Korea Student Fair 2008 , which opens on Oct. 4 for a two-day run at the COEX in downtown Seoul as part of its ongoing efforts to refresh awareness of the benefits of studying English in the Philippines. Among ESL school representatives set up booths at COEX include Cebu Pacific International Language School (CPILS). Cleverlearn English Language Institute (CELI), CML Native Speakers Tutorial Center (CML), First English Learning Academy (FELA) and Cebu English Language Learning Academy (BEST CELLA). 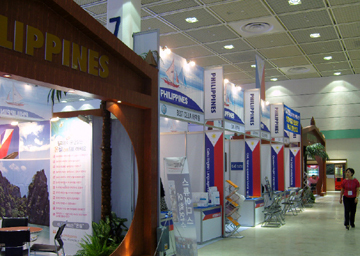 Philippine Airlines (PAL) Korea will donate four complimentary air tickets for the raffle draws at the Philippine booth. Two tickets en route Incheon-Manila-Incheon or Inheon-Cebu-Incheon will be given to winners of the raffle draws per day at the Philippine booth. All in all, PDOT opens 15 booths at COEX where consular services of the Philippine Embassy for student visas and other valuable and practical info are also made available. "With the very good location combined with quality language education service, hopefully we get more Korean people interested to consider the Philippines for their ESL or long-term studies," Ms Maricon Basco-Ebron, tourism director and tourism attaché at the Philippine Embassy in Seoul said pointing out that South Koreans have been being educated in English in the Philippines for almost 30 years despite of the fact that not a few Koreans still think of studying English abroad like the USA and Canada. . The history of the South Koreans learning English in the Philippines started in the 1980's and became immensely popular in the early 90's. The most popular cities are Manila, Cebu, Baguio, and Boracay. The Philippines offer a competitive alternative to already established English teaching destinations with a more than fair price and a much shorter trip. The Philippines as a venue to learn English remains to be a very well acknowledged position in the Korean market. This has encouraged a greater number of Filipino schools and tour operators to participate in the Korean Student Fair, enabling them to capture a larger share of the growing outbound student sector. The number of Korean tourists to the Philippines has recently gone down 25 percent as the Korean economy has also been affected by the slowdown of the US economy and the depreciation of the won. Fewer Koreans are going out of their country to any destination worldwide, not just the Philippines. "Like any slump in the tourism industry, this is seasonal. even at this time we should continue to be aggressive in promoting the industry so we will be in a good position after the slump," Ms. Ebron quoted Philippine Tourism Secretary Durano as having said. The financial crisis in the United States, which caused the weakening of the US market, has affected the economy in South Korea. The US is a major consumer of South Korean exports. To sustain growth in the industry, the secretary was quoted as saying that the Department of Tourism continues to promote the country to various markets, including those interested in adventure tourism. Secretary Durano went on to say that the Philippines can take advantage of adventure tourism that with the US market alone — and even under present financial circumstances — has a potential to bring in revenues amounting to $450 million a year. Cebu is a good destination for soft to extreme adventure, he said. Even with government's funding constraints, adventure tourism can be developed because there is no need for additional infrastructure, particularly for extreme activities, he said. "The tourist has an authentic experience with the community," he said.